I was aiming to mix up a 1 to 1 1/2 pound cut of shellac. What I ended up with, I am not exactly sure. You see, I don’t measure…I don’t like to measure. I don’t even like to measure when I am building. I’d rather use dividers, a sector, and relative dimension. Otherwise, it gets too complicated for me. Basically, I grabbed what looked to be about 1/4 lb of shellac. I have a 1 lb bag, so I eyeballed a 1/4 of the bag. Throw it in the mason jar like Emril…BAM! Pour in some alc like Emril…BAM! BAM! Shake it up and let it get happy! I have no idea what I got…somewhere bewteen 1 to 1 1/2 pound cut if I had to guess. Doesn’t matter. I spent the rest of the night watching my new favorite show,”Falling Skies”, while shaking the shellac occasionally. Then I shook it while brushing my teeth. Then I gave it one last shake before going to bed. The next morning, the shellac was still not dissolved…strange. So, before leaving for work, I shook it again. When I came home from work, it was still not dissolved…hmm. Well, I couldn’t wait any longer…I needed to apply what I had. My solution was to pour off (decant) the dissolved portion into another jar. I tested this solution on a scrap block. Everything was flowing well, and I was happy with the drying time. This is where I usually make any adjustments. Depending upon how the shellac is flowing and how quickly it is drying on that test scrap. Usually, I end up adding some alcohol to give me a longer drying time. 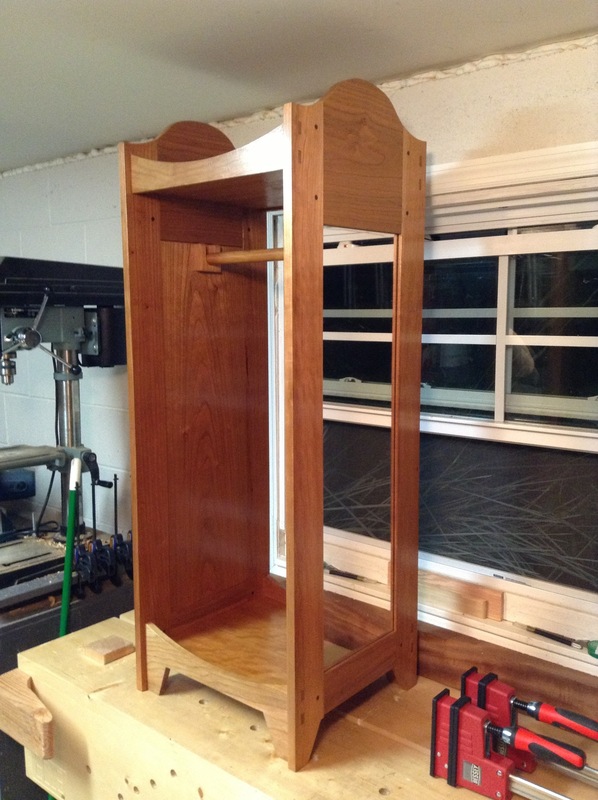 I began coating the chiffonier and all was going well. 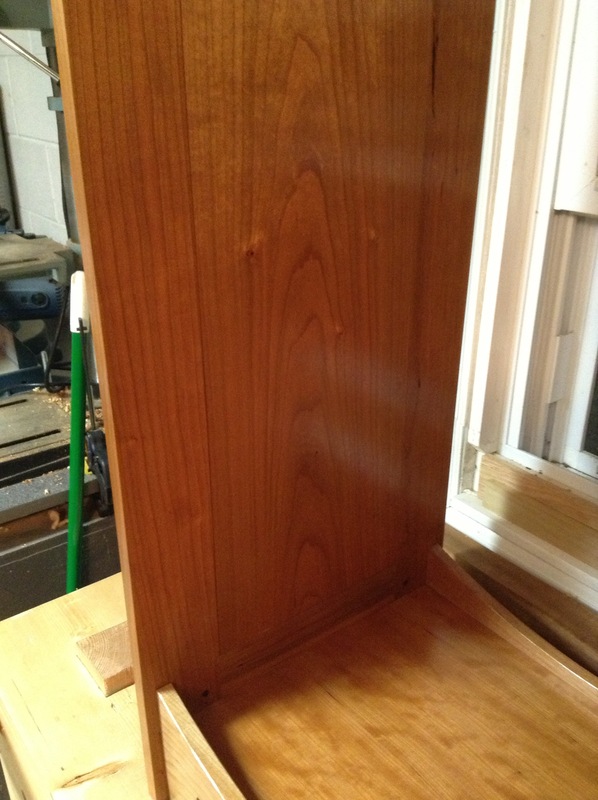 However, about 30 minutes into it, the shellac really started evaporating quickly…so I stopped for the night. Before the next application on the following night I added some alcohol…not sure how much, just poured some in. I also filled a second jar with alcohol to charge my brush. In the beginning, and occasionally as the brush started to build up shellac, I dipped the brush into the alcohol. These two adjustments allowed me to apply 3-4 coats in one evening. After letting it sit for a couple of days, it looks really good. I like the color and the build of the finish. I think I will stop here. I would imagine it has about 5-6 total coats of shellac. Right now it looks very shiny…but I will rub that out after a few more days of curing. 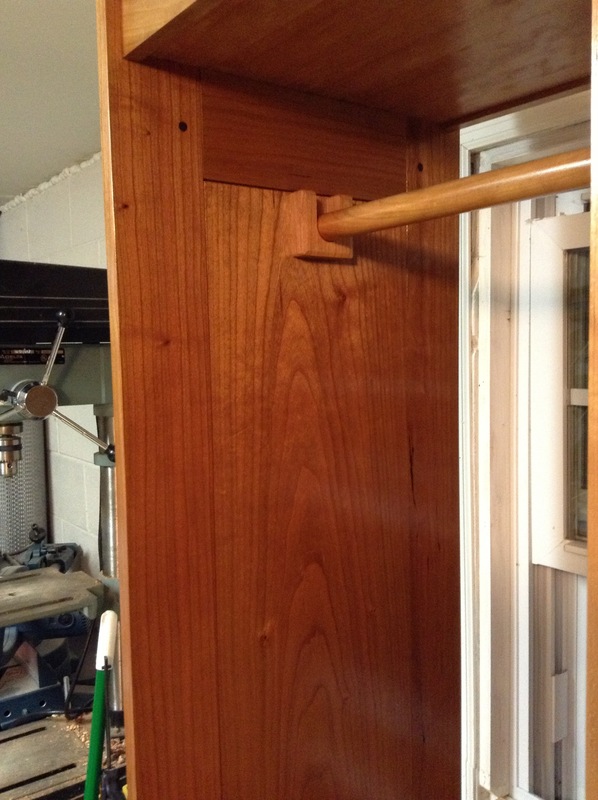 This entry was posted in Chiffonier, finishing, furniture, hand tools, VCF, woodworking and tagged cherry, chiffonier, shellac, woodworking by villagecustomfurniture. Bookmark the permalink.